Apple on Tuesday was granted patent rights to an all-purpose docking solution for iPad and embedded sensor technology that could one day lead to an iPhone capable of informing its user of changes in temperature and humidity. As granted by the U.S. Patent and Trademark Office, Apple's U.S. Patent No. 9,163,775 for a "Magnetic stand for electronic device" details a magnetic iPad stand designed to integrally fit with the tablet chassis and interact with a variety of standalone mounts. The invention was first revealed as a patent application in 2013. In its patent, Apple says iPad, a device that has found use in a variety of work environments, deserves a magnetic mounting system that is equally functional and aesthetically pleasing. The document suggests using iPad's existing magnetic attachment points as a basis for a new mounting solution, one that is more rigid and robust than Apple's Smart Cover and Smart Case products. As illustrated below, an ideal mount takes the shape of an elongated cup that slides over the long end of an iPad, attaching via friction and magnets disposed in a metal shunt. The design prevents magnetic energy from leaking out of the tablet holder and interfering with sensitive equipment like credit card readers. Optional enhancements include spring mounted doors that prevent metallic objects from being drawn in by the powerful magnets situated at the bottom of the cupped portion. A number of mounting connectors can be functionally attached to the tablet holder by a threaded hole, clip, clamp, suction cup or other method. Once configured, the proposed iPad holder is capable of connecting to a variety of useful mounts, including tripods, music stands, treadmills, car dashboards and more. One example describes two iPads being joined together with a hinge mechanism to create a digital book. It is unknown if Apple plans to market its iPad mount concept, but the company has recently exhibited a renewed interest in tablet accessories with iPad Pro's Apple Pencil and Smart Keyboard. Apple went so far as to develop specialized connection technology dubbed Smart Connector, purpose-built for powering and transferring data between keyboards, accessories and iPad. Apple's iPad mount patent as granted was filed for in August 2014 and credits Matthew D. Rohrbach as its inventor. Also granted on Tuesday was U.S. Patent No. 9,167,325 for "Electronic devices with environmental sensors." The property, first revealed in an application in 2014, describes a method of integrating multiple environmental sensors, such as temperature, barometric pressure, humidity and others, into a single sensor package. As many of the proposed sensors require access to a free flow of air to operate effectively, a device chassis must include openings to provide adequate ventilation. 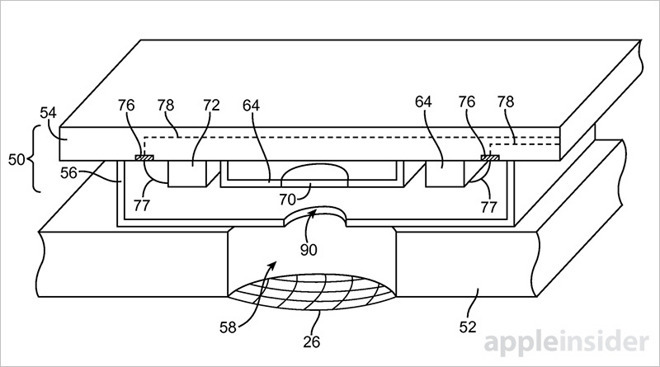 To avoid exposing sensitive circuitry to the elements, Apple proposes packaging said environmental sensors on the same rigid circuit board as a sound component, such as a microphone or speaker. A standalone enclosure within a device housing can expose an environmental sensor stack to outside air without adversely affecting bare internal circuits. As for the acoustic components, Apple already protects these parts with mesh or thin acoustic membranes in current iOS device designs. While other tech companies are experimenting with embedded thermometers, UV meters and other environmental sensing modules, Apple only recently added a barometric pressure sensors to its arsenal in iPhone 6. The company's ambitions remain unclear, but with Apple Watch targeting consumers living active lifestyles, a more comprehensive sensor suite could be in the works. Apple's environmental sensor package patent was first filed for in 2012 and credits Henry H. Yang, Matthew E. Last and Romain A. Teil as its inventors.